I am writing this blog to share news about the new American Century Investments report regarding their connection to medical research, and a potential treatment for cancerous tumors, in addition to thanking them and all the tournament sponsors like NBC Sports (http://youtu.be/NjHeBTdAJXk) and Tahoe South for the wonderful Vessel golf bag, Profits with a Purpose gift, monogramed with Sports Techie. 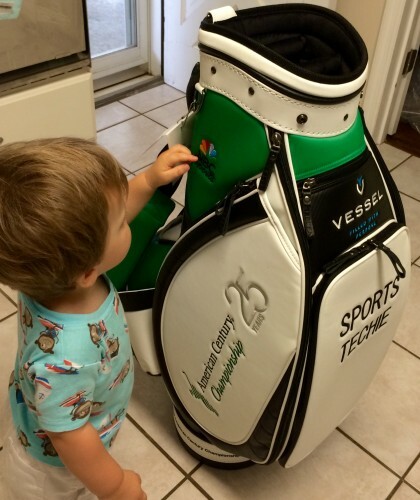 As an inspired advocate of American Century Investments and Profits with a Purpose it was my pleasure to Spread the Word about the American Century Championship via a Sports Techie community blog because everyone is affected by cancer and together we can make a real difference to win against this terrible disease. Follow hashtags #ACCgolf #GiveLikeJim for constant updates. I am writing this blog to share news about the new American Century Investments report regarding their connection to medical research, and a potential treatment for cancerous tumors, in addition to thanking them and all the tournament sponsors like NBC Sports (http://youtu.be/NjHeBTdAJXk) and Tahoe South for the wonderful Vessel golf bag, Profits with a Purpose gift monogramed with Sports Techie. Nearly every week I read an inspiring message or a dire update about someone fighting for survival because of cancer on my personal and company social media network. So here is to all the men, women and children, and elderly and animals, keep the faith and press on, hope is on the way. 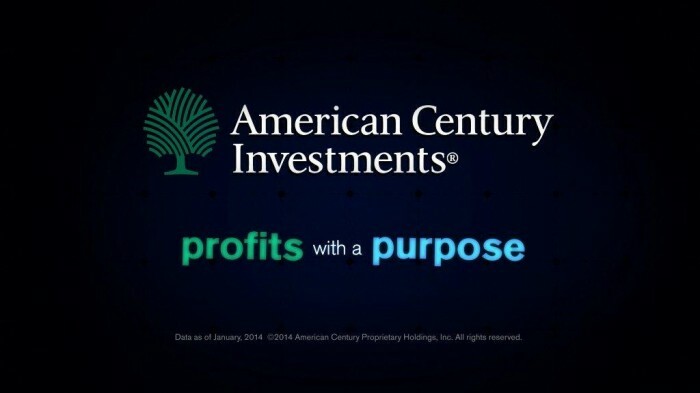 Link to American Century Investments Profits with a Purpose website, Profits with a Purpose. The American Century Investments ownership structure is unique and made possible through the generosity and vision of its late founder James E. Stowers and his wife, Virginia. As cancer survivors, Mr. and Mrs. Stowers decided to use their personal wealth to establish and endow the Stowers Institute for Medical Research and BioMed Valley Discoveries; two institutions that study and research cancer and gene-based diseases, with a focus on moving these discoveries from the lab to practical applications in the medical world. Each year more than 40% of American Century Investments’ profits are distributed to funding the Stowers Institute for Medical Research and BVD. On August 13, Science Translational Medicine published an article by BioMed Valley Discoveries, the Johns Hopkins Kimmel Cancer Center, the University of TexasMD Anderson Cancer Center and their collaborators about preliminary results from animal and human clinical trials of a potential anti-tumor therapy. The new treatment relies on the bacterium C. novyi-NT to destroy cancerous tumors from within. The article notes that after seeing encouraging results with dogs, the bacteria therapy was used to treat a human patient with advanced bone and soft tissue cancer. The treatment significantly reduced the tumor mass within and surrounding the bone. The authors of the article conclude that C. novyi-NT can act as a controlled agent to precisely destroy oxygen-poor tumor tissue, and that further human clinical trials are warranted. As a Profits with a Purpose influencer, I shared in the sense of pride felt from the American Century connection with research that may eventually lead to treatments for cancer and other diseases. This groundbreaking research truly exemplifies “Profits with a Purpose” and “Hope for Life”. Read the TIME article here: Treating Cancer with Bacteria Shows Real Promise. The 34th Ryder Cup Matches started today at the PGA Centenary Golf Course at the Gleneagles Hotel in Scotland, and the European team is looking for a three-peat after waiting two years for this thrilling International event to begin. Many late stage cancer patients would be thrilled to have two more years to live so I mention this tournament knowing it may be the last one for some Sports Techie golf fans so keep that in mind with positive thoughts as you tune in. I hope you have a chance to root on the American or Euro team wherever you, knowing the fight against cancer is dear to every person and animal on the planet. The matches are televised on television and mobile device apps here in the U.S. via the Golf Channel and NBC. Sky Sports will provide TV coverage in the UK and Ireland over the three-day match play golf event. NBC Sports also broadcasted the American Century Championship 25 years hosted by Edgewood Tahoe golf course. Professional athletes, legends of the games and Hollywood entertainers such as Aaron Rodgers, Stephen Curry and Charles Barkley, Annika Sorenstam, and Kevin Nealon helped raise significant amounts of money for charity. This post was created in partnership with American Century Investments. I have received compensation for this post. However, all thoughts and opinions are my own. 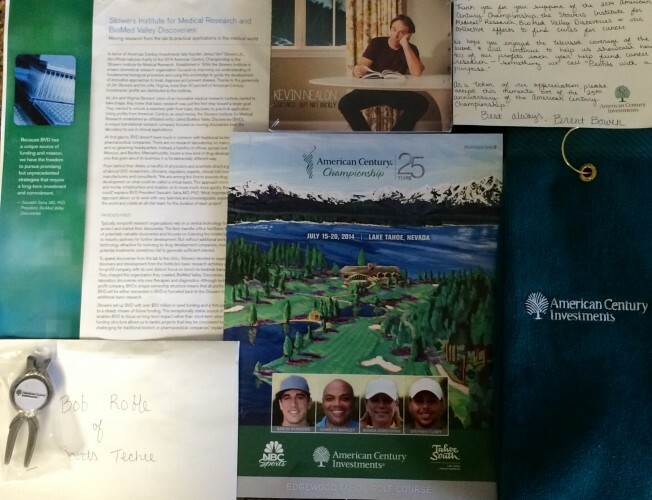 Thank you American Century Investments profits with a purpose for the gifts such as the nice letter, official #ACCgolf program and BVD information, golf bag, towel and divot replacement tool, and Kevin Nealon DVD. Animals are also part of the Sports Techie community, whether they are pets, in zoos and aquariums, or in the wild and massive oceans. My brother has a boxer named Deuce that is over nine years old and has lived a fun and fulfilling life in Bend, Oregon, with his former roommate Candace. Just a few days ago, she noticed a red, blister like area on his jaw where he recently had surgery for teeth that were rotten. All signs point to cancer. Why I share this story is because now comes the wait. The process is the same for family and friends, as it is for strangers and animals. Follow up tests are conducted when a lump or sickness is revealed and then we sit back and wait to hear the dreaded diagnosis of the C word, hoping that the Doctor or Veterinarian does not say its cancer. The moral of this blog is to live life one day at a time and to use sports, exercise and activity as your ally to prevent and fight cancer. The new danger our society faces in 2014 is not smoking and second-hand smoke since we already know that it truly causes cancer. The newest alarming facts are that ‘sitting’ is the root cause of many cancers. Sitting in an office all day, lying on your couch with the channel clicker, or being glued to your second screen smartphones, tablets and laptops concerned about social media updates, are lethargic things humans did not do a hundred years back when cancer was rare and the environment was cleaner. So do me a favor and after you read and then share this blog, please go outside for a walk, run or bike ride, and start or keep up a conditioning program that is indeed, lifelong. My Father always told our family that boredom comes from within and defeating obesity is a lifetime game. The only way to win against cancer, other than costly medical procedures is via a wellness, diet and rest, sea of change. Start by making fitness a daily part of your Sports Techie lifestyle routine. Invest in a new activity or fitness tracker that will help you track and meet exercise goals via the support of this marvelous sports tech product. Thank God, Allah or whatever spiritual entity you have faith in for each day we have on this blessed earth, and if you don’t roll that way keep up a positive mindset, and always remember that American Century Investments and BVD, plus thousands of other passionate and compassionate corporations, charities and researchers, are on our team to help beat down cancer for good.